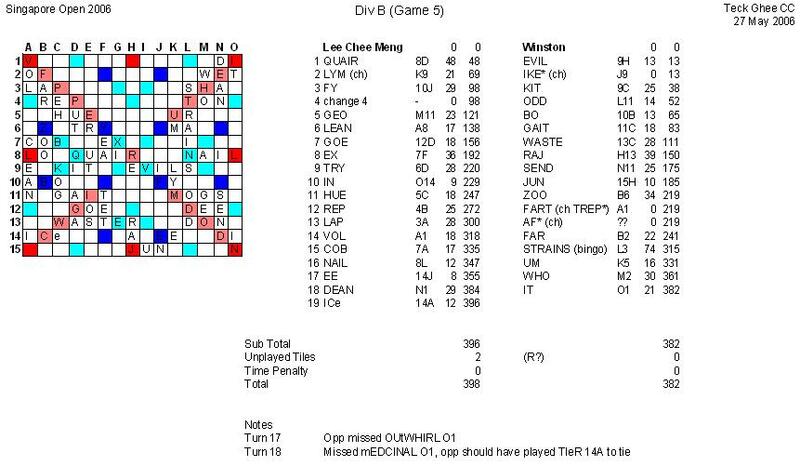 This is my first time playing Scrabble in Teck Ghee CC. Didn't have much trouble locating it as I have a street directory with the bus stop information in my bag. Saw many familiar faces as I reached there: Marcus, JoBeth, Valli and Peter Tay to name a few. 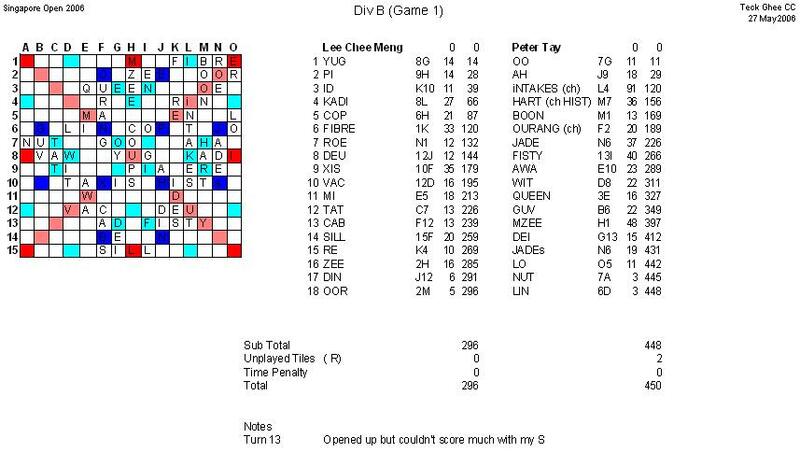 Haven't seen Peter Tay for a long while since the last time I played him in the Millenium Cup, so was quite happy to be able to play with him again. 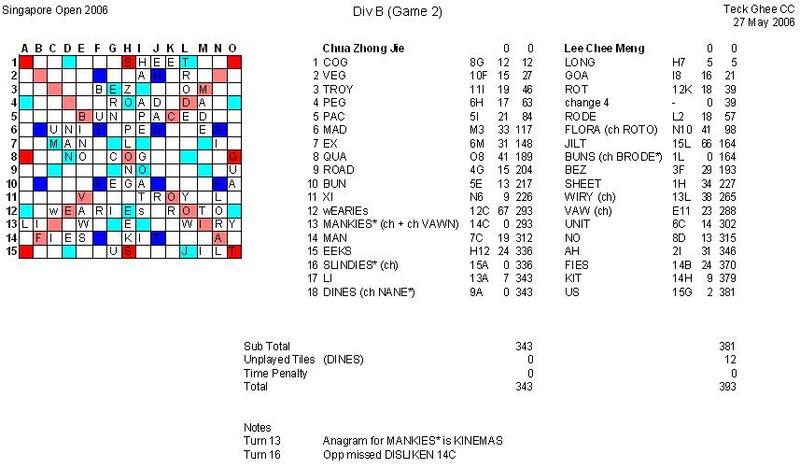 Found out that I was playing with him for my first game after the organisers did the pairings. Learnt many new words from Peter Tay. Spent a long time deciding whether to put FIBRE or FIBER across a TWS line and was still shuffling the tiles around after I put down the word until I decided that FIBRE looks more right. Catherine who was observing the game at the side told me that both words were valid after I pressed the clock. 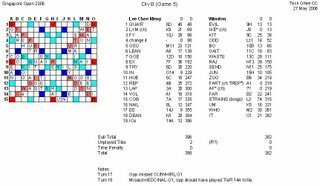 Lost as Peter bingoed with INTAKES(91) and made many high scoring moves. L 296-450, -154. 0W 1L (Accum spread -154). L 393-343, +50. 1W 1L (Accum spread -104). Was totally out of luck in this game! Had the "J" and the "Z", but Victor had both blanks, all four "S" and the "K", "Q" and "X". 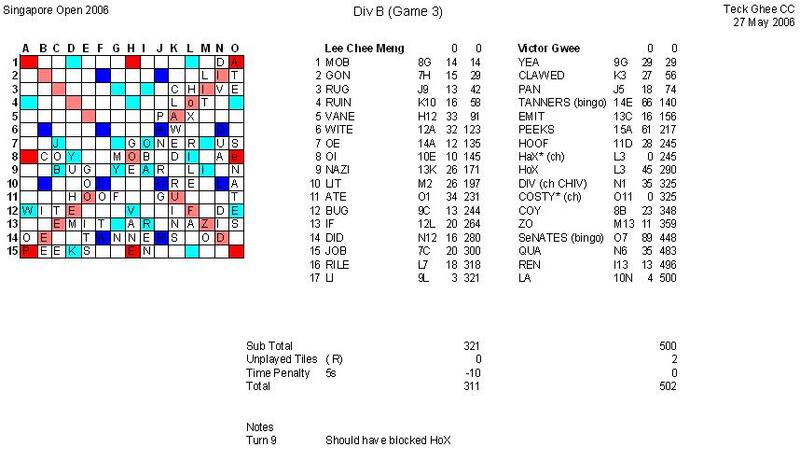 Made a very silly mistake when Victor put down HaX* M3 next to an existing CLAW L3 and PAN K5. I challenged it off but made no attempt to block it as I thought HeX would be safe as Le* would not be good. Victor promptly put HoX on his next move to score! 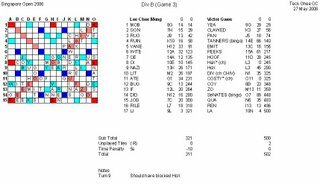 He won with many high scoring moves and two bingos: TANNERS(66) and SENATES(89). L 311-502, -191. 1W 2L (Accum spread -295). 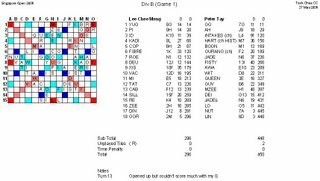 Fell behind when my opponent put down ENZYME(44) for his first move but caught up as I made two bingos PRINTERS(74) and TINIEST(71). My opponent replied with DRAINED(76) and with all the remaining "O"s on his rack, he did a pretty good setup with JUT N1. I attempted to block with UG 2N but realised later that he could also have the "G" and the "U" on his rack to form a 3-letter J word. Luckily he didn't see that word and I got away with a comfortable win! W 410-302, +108. 2W 2L (Accum spread -187). I started very well with QUAIR(48) but Winston was able to catch up when he bingoed with STRAINS(74). He could have overtook me if he had not wasted a few moves playing phoneys that were challenged off. A nail biting finish and I was just able to edge him out for a win! 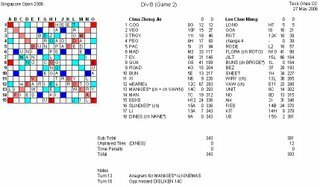 Probably worth analysing the end game to see if there were more optimal scoring moves. L 398-382, +16. 3W 2L (Accum spread -171). Ended the first day pretty well with 3 wins out of 5 although my spread is terrible. Hope to do better the next day! Guess which player has the favorite phrase: "I am one hundred percent sure!". I hear him say that so often that I could subconciously hear him shouting out that phrase whenever I think about Scrabble. If you have no idea who he is, just ask any active intermediate player and they'll know straight away! 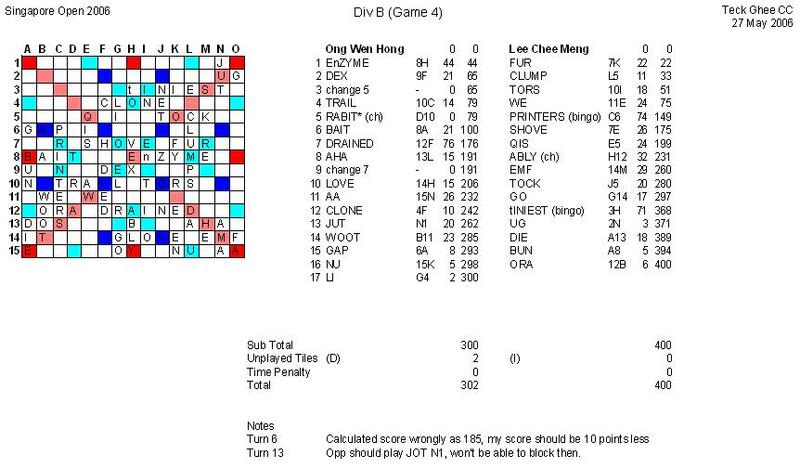 Think it would be interesting if someone wrote an article about the idiosyncracies of the players in the Singapore Scrabble scene. I'll consider Marcus as one of the most interesting players!